Will Young, Jonny Labey and Zizi Strallen will lead the cast of Baz Luhrmann’s Strictly Ballroom The Musical when it makes its West End debut at the Piccadilly Theatre in 2018. Directed by the Olivier Award-winning Drew McOnie, Strictly Ballroom will star Pop Idol winner Will in the brand new role of band leader, Wally Strand, in this romantic story of a ballroom dancer who defies all the rules. Making his West End debut is ITV show Dance Dance Dance winner Jonny, who plays the leading role of Scott Hastings, the maverick ballroom dancer, while Zizi Strallen, currently starring in Follies at the National Theatre, will play up-and-coming dance partner Fran. Based on the multi award-winning movie, the first instalment from Baz Luhrmann’s acclaimed Red Curtain Trilogy, the Strictly Ballroom musical production is a kaleidoscope of colour and fun. When rogue championship ballroom dancer Scott defies all the rules of competition to follow his heart, he teams up with left-footed partner Fran to compete in the Pan Pacific Championship his own way. Their love blossoms as their routines flourish, and together they triumph in bringing down the sequin-clad regime of the Dance Federation. Featuring the film’s iconic music such as Love Is In The Air, Perhaps Perhaps Perhaps and Time After Time, Strictly Ballroom The Musical will also include electrifying songs from a host of internationally acclaimed artists. Also set to star are Michelle Bishop as Pam Short, Ivan De Freitas as Merv, Gabriela Garcia as Vanessa Cronin, Charlotte Gooch as Tina Sparkle, Richard Grieve as Les Kendall, Liam Marcellino as Wayne Burns, Stephen Matthews as Doug Hastings, Fernando Mira as Rico, Eve Polycarpou as Abuela, Lauren Stroud as Liz Holt, and Gary Watson as Ken Railings. The cast also includes Chris Bennett, Chrissy Brooke, Hannah Fairclough, Selina Hamilton, Christopher D Hunt, Luke Jackson, Justin-Lee Jones, Robin Kent, Jacob Maynard, Leanne Pinder, Tinovimbanashe Sibanda and Dale White. 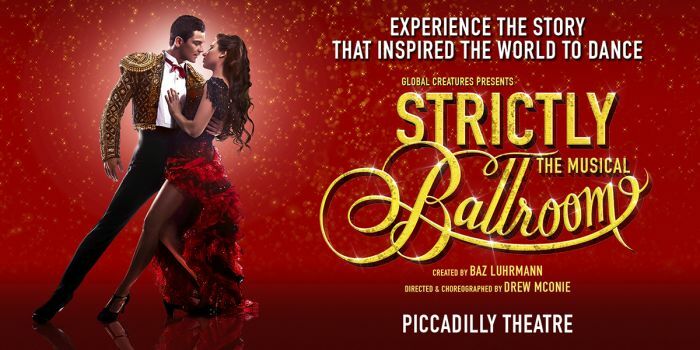 Telling a story that will inspire the world to dance, Strictly Ballroom The Musical will begin performances at the Piccadilly Theatre on Friday 16th March 2018.